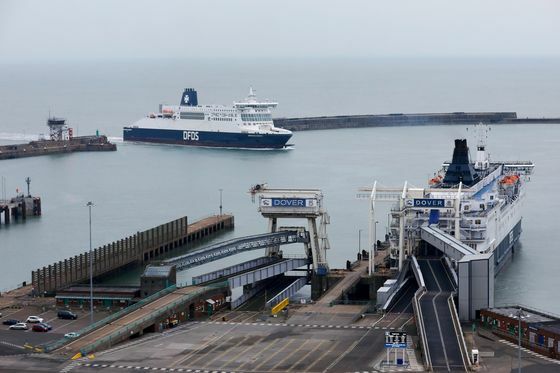 (Bloomberg) -- Britain’s no-deal flotilla is getting ready to set sail, shuttling trucks carrying critical goods into the country starting Friday -- at least two weeks before a possible split from European Union raises any trade barriers. The ferry contracts, totaling 89 million pounds ($118 million), are meant to guard against shortages of items like medicines, vaccines and blood, along with spare parts for the energy sector and essential chemicals. Under six-month terms awarded by the Department for Transport in December, two operators will increase capacity starting on March 29, the original date for Brexit. Denmark’s DFDS received a 42.5 million-pound contract for extra sailings on routes between Immingham, on England’s east coast, and Cuxhaven, Germany, and Rotterdam, and between Felixstowe, also in the east, and Rotterdam. The DfT scrapped a 13.8 million-pound deal with Seaborne Freight, which had no ships and no trading history, in February after the company backing the plan pulled out. Seaborne was meant to reopen a ferry route from Ramsgate, near Dover, to Ostend in Belgium. On top of the doubts surrounding the operator, there was concern that Ramsgate itself wouldn’t be ready for March 29. A second and more expensive blow came with the 33 million pounds the government paid to settle a case with Eurotunnel, operator of the undersea rail link between the U.K. and mainland Europe. The firm had sued over the DfT’s “secretive and flawed procurement exercise” for the award of ferry contracts.